Vocal health can be elusive in our busy, noisy professional lives. People who use their voices extensively in their occupations are particularly susceptible to voice problems such as vocal fatigue and strain, hoarseness, and vocal fold injuries. Teachers, recreational coaches/instructors, customer/sales representatives, politicians, lawyers, clergy, singers, actors, media broadcasters and health care professionals may experience occupational voice problems. Despite the reality that occupational voice users must rely heavily on their voices to perform their daily duties, most do not have any voice training to prepare them for heavy vocal demands. When extensive voice use is combined with noisy speaking environments, unhealthy habits, ergonomic challenges, flawed vocal technique and the stresses of life, it can lead to vocal problems. Linda Rammage, PhD, RSLP, SLP(C), offers vocal rehabilitation programs for individuals experiencing, or wishing to prevent occupational voice problems. The therapy programs are designed specifically to meet the needs of people who use their voices extensively in their work, where vocal health is not only necessary but can be challenged by factors beyond their control. A wide range of topics related to occupational voice use are discussed and healthy voice production techniques are practiced. Opportunities for group learning and discussion are provided, and individual assistance is offered during vocal technique acquisition. To develop a basic understanding of the mechanics of voice and speech production. To learn the foundations for vocal health and explore the relationship between the voice and physical and emotional health. To examine the differences between good voice use, vocal misuse and vocal abuse. To identify and learn to compensate for difficult speaking situations, both on and off the job. To learn to recognize postural imbalances affecting voice production and to restore optimal posture. To recognize specific muscle misuses and restore easy, coordinated use of the vocal system, by exploring how muscles in the breathing system, larynx and vocal tract work together in free and natural voice production. To develop a voice that is free and responsive in all speaking situations. Before being considered as a candidate for a group rehabilitation program you must undergo a comprehensive voice assessment so that all aspects of your problem can be identified and the best form of treatment determined. After seeing your otolaryngology specialist, you may request referral to Linda Rammage for a comprehensive Vocal Function Assessment. 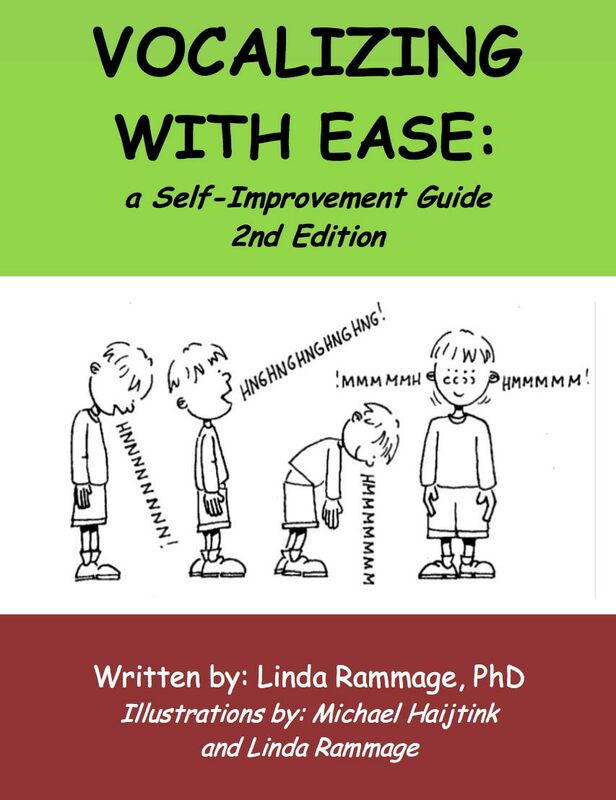 Cost: A one-time registration fee is due in advance of the rehabilitation program and includes the cost of the therapy manual: Vocalizing with Ease: A Self-Improvement Guide. If you have an extended benefit package, you may be able to claim your fee as a reimbursable expense. You should check your extended health benefits program or other third-party payment plan to determine your coverage for speech therapy service expenses. Schedule: Ninety-minute weekly sessions are held for seven consecutive weeks in central Vancouver. Intensive weekend programs may be available based on demand. Philosophy: Success of a voice therapy program depends on full commitment from participants, who will be guided through a succession of steps that allow them to restore optimal voice function. Since demand for voice therapy services is high, priority will be given to those individuals who can commit to attending all sessions of the program. Technique practice determines the ultimate success of your personal voice improvement program and participants will be accountable for following their individualized plans.